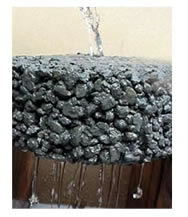 Pervious pavement is a unique cement-based concrete product that has a porous structure that allows rainwater to pass directly through the pavement and into the soil naturally. When used for pavement of parking lots, driveways and sidewalks, pervious concrete provides an environmental benefit and an alternative storm water management option. Not only can pervious concrete reduce storm water runoff, it can also eliminate the need for retention basins, thus limiting the amount of unusable land in large development projects. Available in many color choices to enable color coordination with buildings and landscape. Pervious Concrete can contribute to the LEED Storm Water Management credit. Light colored surfaces are cooler, safer, and energy efficient (reduced lighting demand). Economical choice for the long term, because of its strength, durability and minimal maintenance requirements. Meet storm water management & first flush pollution prevention criteria (Infiltration BMP). Reduce or eliminate storm sewer tie-ins. Durable –30 year + life. Reduced grading reduces engineering time and construction time and expense. Reduces pollution, as the major organic component of parking area runoff is the hydrocarbons (oils) from the asphalt binder of the parking area itself.